TALLAHASSEE – Only a week into his new role as pastor of Florida’s largest Wesley Foundation ministry, Rev. Mike Toluba was ticking off the pros and cons of the spot staked out more than 50 years ago at 705 W. Jefferson St.
“We’re kind of close to the heart of the campus,” he said, as a group of parents and prospective freshmen waited a few blocks down the street to tour Florida State University (FSU). FSU Wesley's Chapel of The Upper Room, built in 1970, is showing signs of wear that are cost-prohibitive to repair. Photos by Susan Green. Above, Rev. 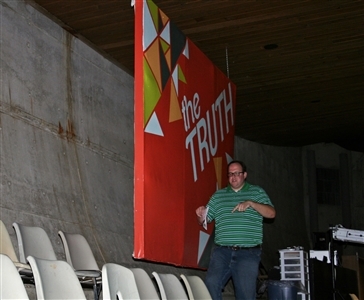 Mike Toluba, FSU Wesley pastor, talks about the cracks in the chapel wall that are disguised by large banners. Below, Toluba discusses the chapel's design that is less than ideal for today's students. And the foundation’s spirit is everything he could have hoped for. “There’s been a real spirit of radical hospitality here,” Toluba said. The physical state of the ministry, however, is another matter. At FSU, the Wesley welcome is warm but, structurally speaking, a little worn. In fact, the Florida Conference Board of Higher Education and Campus Ministry (BHECM) has determined that the Wesley headquarters and chapel must be vacated by 2018, said Rev. David Fuquay, the ministry’s director. “BHECM, the Florida Conference trustees and the FSU Wesley board are all working together on plans for a new facility and a strategy for funding of the new facility,” Fuquay said in an email. The building that houses offices, fellowship space, a library and a kitchen was built in 1950, according to a plaque on the façade. Part of it had to be demolished a few years ago because the foundation was crumbling, Toluba said. Inside, a handful of Wesley staff members and volunteers recently were shouldering past each other in the cramped kitchen as they put together a meal of burritos and brownies for the Wednesday night gathering, expected to fetch a summer crowd of around 60. In the fall, that number will swell into the hundreds. Billiards and foosball tables occupied spots on a stage at one end of the fellowship hall to allow more room for people to mill around in the open space. 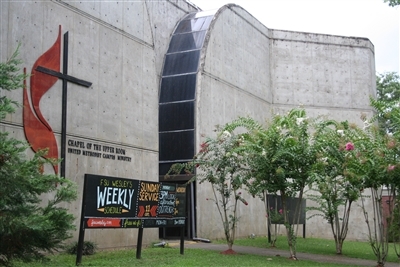 Next door, towering over the Wesley House, is the ministry’s chapel, built in the 1970s. “Some folks on campus call it the bomb shelter because it’s a big concrete building,” Toluba said. The roof was designed so that the swooping ceiling inside would resemble a chalice, the pastor said. Unfortunately, the chalice is prone to leaks, and a protective membrane stretched over the roof is nearing its expiration date. 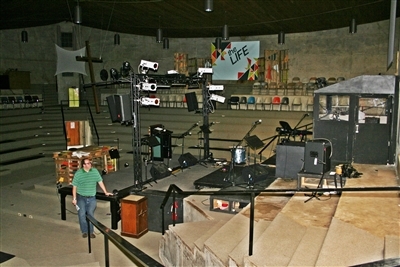 Inside, the imposing worship space resembles stadium seating in the round. Seats were never installed on the cascading terraces that surround the ground-level platform, but hundreds of students and their families and friends can gather comfortably. Sunday services during the winter and spring semesters typically draw 500 to 600 worshipers, and the number swells higher during special events like Parents’ Weekend. The design probably worked well when there was an organ and choir leading worship, Toluba said. Now that tastes trend toward praise bands, it’s less endearing. Not only that, but the walls sport cracks strategically hidden by large banners that carry inspirational messages. 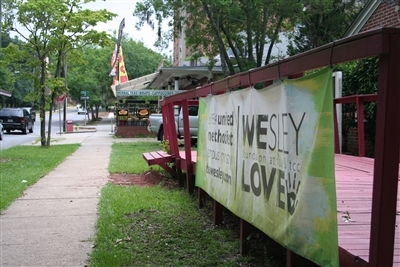 FSU Wesley's location on a street near the heart of the Florida State campus offers a natural draw for the student ministry. 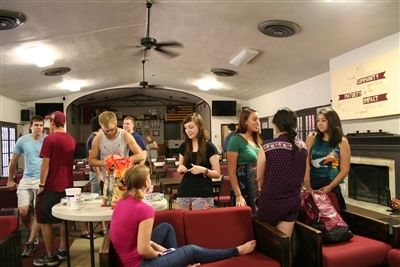 Below, students enjoy relaxing and socializing in the Wesley fellowship hall before a Wednesday night gathering. Two independent engineering assessments determined it would be too costly to restore and renovate the headquarters and chapel, Fuquay said. Certain building warranties will expire in 2018 and the conference can’t afford to keep the structures safe for student use without them, he said. On the plus side, Toluba said the ministry’s apartment-style housing that accommodates up to 15 students is faring well, and no major projects are needed there. An early estimate for replacing the deteriorating buildings came in around $12 million, Toluba said. Since then, conference and Wesley Foundation leaders have kicked around the idea of a single large metal structure coated in a brick façade that would cost an estimated $2.5 million. Any new digs would have to blend in with the campus environment, Toluba pointed out. FSU Wesley, with 18 young people currently in seminary, has long been a springboard for budding clergy. Partnering with the Florida Conference to create a formal “incubator program” for students who hear the call to ministry could possibly raise more dollars toward a new facility, Toluba said. Students interviewed in July at a Wednesday night fellowship supper said they keep coming back because of the warm Wesley atmosphere. “It’s a very positive community,” reflected Benjamin Robinson of Tallahassee, who attends Tallahassee Community College with plans to transfer soon to FSU. Caroline Johnson of Tampa started attending Wesley as a freshman three years ago.